This is a special spectrum, it was taken with PRA 5.0 using two sodium iodide detectors, in coincidence counting mode, to detect the annihilation gammas that are produced when 22Na undergoes beta+ decay. The positron instantly annihilates with an electron, producing two 511 keV gammas at a 180˚ angle. 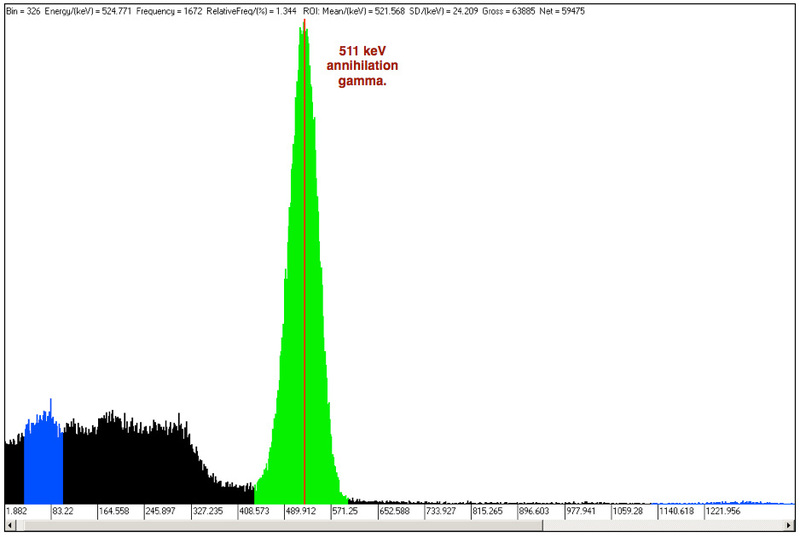 The two diametrically ejected gamma rays are detected using two NaI detectors and two GS-1100A and PRA 5.0. A special jack plug adaptor is required, to convert the two mono jack plugs into one stereo jack plug. PRA-5.0 uses the stereo channel feature of the PC sound card, to collect two simultaneous streams of pulses, and filtering the signal by anti-coincidence or coincidence pulses.